After you create a role, it will be available for editing within the “Manage roles” subsection. This page contains the Name of the role and offers the abilities to filter and sort by its name. Also, you can change over to the page of role creation by clicking on the “Create role” button. 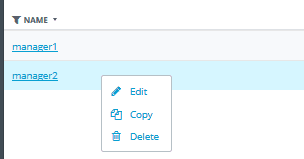 Additionally, you can access such actions as “Edit,” “Copy,” “Delete” by right-clicking the desired line with a role. Please note that a role assigned to at least one user cannot be deleted.